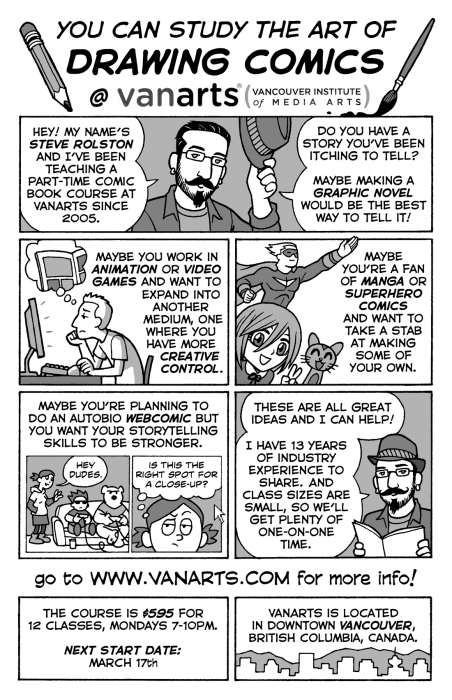 My next Introduction to Comic Book Production course at VanArts will be starting up on March 17th, so now’s the time to sign up! It’s a 12-week course that runs on Monday nights (or Tuesday if there’s a holiday) in Downtown Vancouver, Canada. I take my students through the process of writing, thumbnailing, penciling, inking and lettering a four-page comic. There’s a strong emphasis on clear storytelling, in addition to teaching all the other things I’ve learned during my fourteen years as a comic book artist.